‘Do you think there is only one Chakraborty here?” one of them asked me, seeing me hesitate. Bright noontime, the sun out after two gloomy days. The inter-district bus terminal was on the outskirts of Mymensingh, a town with a long history. Rickshaw-wallahs surounded me, all eager to take us to my destination. ‘How much for going to Amlapara?’ I asked one. ‘Twelve taka,’ he said. Proshenjit frowned at the rickshaw driver. He had eagerly wanted to take charge after we got down from the bus. He was thirteen years old and wanted to act like an adult. And besides, wasn’t Mymensingh his town? ‘It’s ten takas at the most,’ he said. But the rickshawpuller had a surprise for me. ‘Shouldn’t you give something extra because of puja?’ he said. At this point I felt compelled to join the exchange. ‘So is there a Hindu population here from whom to claim puja extras? ‘What are you saying?’ asked the rickshawpuller. ‘That we don’t have Hindus in Mymensingh? The place you are going, only Hindus live there. You must be one, too!’ He had known on seeing me that I was not a native of Mymensingh. Which made me feel that that was reason enough to get on his rickshaw. Proshenjit tried to conceal his disappointment. Riding in the rickshaw, I thought that I should stick to my plan of leaving for Kishoreganj before noon so that I could lunch at the place I was going. But I had doubts whether Projensit’s mother would allow me to leave since it was my first-ever visit to their house, specially during Durga-puja. The rickshawpuller, Ali, attempted to give me (an outsider) an overview of the puja festivities in Mymensingh. At the end of every little lecture he would underline it for me: ‘Bujhlen to? You understand?” Proshenjit was happy at this, that his town, and the event of Durga puja, was being narrated. I had been thinking about asking him whether he too was a singer like his father, Sunil Karmakar, a legendary ‘baul’ singer from this region. But he seemed to be enjoying the rickshaw ride, silent and smiling with his face down on his chest, that it seemed the wrong time. Instead I concentrated on Ali. At the time the rickshaw was passing Charpara, and I could see the top of the tin-roofed house Ramzan had once taken us to. I thought of stopping there, but then decided that I really should stick to my schedule. Maybe tomorrow I would have time to go see him! In the meantime I had missed Ali’s comments on the previous years’ incidents on Durga pujas. On a very stormy night, we–a friend and I–had been on a bus to Mymensingh. We had very naively thought that we would reach there by 11 p.m. at night, and then somehow still make it to Muktagacha. When our bus reached Mymensingh, it was almost 1 a.m. It was raining heavily and our only option had been to stay in a hotel. Ramzan, the conductor on our bus, made us change our plans. He took us to a 24-hours-open restaurant in front of the medical college, fed us well, and then took us to his home. A midnight visit to his parents, in a tin-roofed house lighted with a kerosene lamp. We had entered to see the smiling faces of his mother and grandmother. We met his father the next morning. That had been Sahebpara in Charpara! Later, I could only talk to Ramzan over the telephone. He came to Dhaka after getting married. He had left home after facing a bit of a crisis with his family. He had called me probably expecting the same care from me that he had shown us that dark night. And I had avoided it. Yet, over the phone he remained his polite self and invited me to visit him to the hotel in Gulistan he had been staying with his wife. I had promised to do that, but somehow never made it. It was in 2001. And Ramzan never did call me again. Where the road turned toward Amlapara we could hear puja prayers carried over loudspeakers. At first it was only a single priest, but then I heard two, then three. Four. Five. It was the third day of prayer. By the time we came to a stop before Proshenjit’s house I was feeling bitterly guilty about my behaviour towards Ramzan. Which had made me inattentive to what Ali had been saying about Mymensingh. Proshenjit was also giving accompanying asides: about how many protimas he guessed were there, how many of them were in his familiar spots, etc. I was a little surprised when I learnt that there were some 40 spots for puja in Mymesingh. I asked him if Hindi film songs were played. He was a bit surprised by the question and then said yes, that after prayers were completed those songs were played. I found their house full of visitors. His mother was very pleasant. I gave her a brief explanation why I couldn’t stay for lunch, that I needed to reach Kishoreganj very soon since my friend was waiting for me there. When I left their house, Proshenjit’s mother and others bade me goodbye, insisting that I should come over the next day on my way back. Friday in a mofusshil town! I expected silence. Markets and shops in Mymensingh were closed and it was not yet time for Jumma prayer. But as soon as my rickshaw got going I was flabbergasted to see a huge flow of people up and down the streets in the neighbourhood. Women with a typically common Hindu look, children with their new clothes, and the men strolling indifferently. Puja prayer time was over and Proshenjit proved to be quite right about Hindi songs. Kalibari Road was jammed with people, with at least five puja spots on it. This was Mymensingh: a colonial imprint along with a feudal desire to preserve heritage and culture. Identities were being contested: Congress Jubilee Road inevitably led to Ismail Road. And on a Friday, with Jumma prayers to be held, there were so many Hindus on the road that I felt uncomfortable about having presumed that puja celebrations here would have been puny. Here again, the rickshawpuller seemed to sense my thoughts. Without being asked he suggested that the Commonwealth parliamentary summit in Dhaka was the reason behind the successful puja. ‘A big meeting in Dhaka, men have come from outside. So this time puja is peaceful. Do you get my point?’ he asked me. ‘Uhh…Humm!’ however, was all I said in reply. I had gotten the point. There were decorated gates on the street. I stopped thinking about serious matters and just concentrated on the gates–huge and colourful. Susmita had given me directions to their home. She even had suggested that her husband Newton, my old friend, should pick me up at the bus-stop. I had said no. But getting down from the bus, I saw that I had only a very rough idea how to proceed. I saw some young men in sofed pajamas and dhuti beside a pond and asked them ‘Where is the Chakraborty house? ‘Oh,’ he said, and gave directions to the rickshaw-puller, not to me. There was an old jomidar bari near their house. On the way there, Susmita and I passed a cinema hall crowded with Friday moviegeoers. The bari was being maintained by somebody who had inherited it. It had a large compound, a building and a mandir. ‘Don’t they have legal complications with this property?’ I asked Susmita. ‘No. I think one of the owners is already a lawyer,’ Susmita said firmly. The mandir had a small Durga idol inside, but not centrally placed. So I asked once again what mandir was it. ‘I suppose Radha-Krishna,’ Susmita replied. We then found the murtis of Radha and Krishna, but then also saw another idol, fair-looking, unlike Krishna, but in the typical tribhongo style of Krishna. It was quite confusing. The sculptures themselves were not particularly good. But the style of the third idol still puzzled me. I became sure it was Balaram, Krishna’s brother by chance and boyhood mate. But then why should Balaram be in tribhongo style? However, I chided myself, who am I to question an artist’s imagination. Later than night, mashima told me that it was indeed a mandir of Balaram. 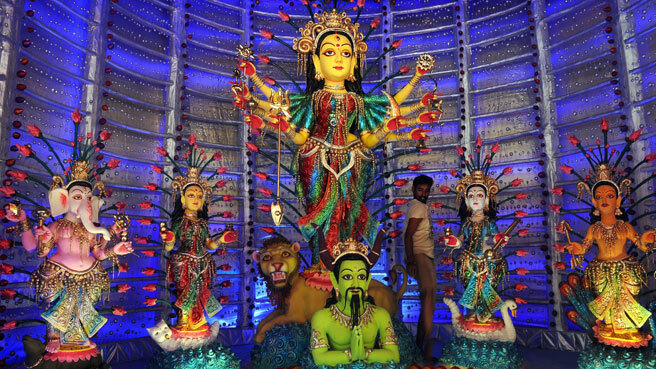 When we visited the puja spots in the evening, like in Mymensingh, it was crowded. A few drops of rain began to fall. Little Lalon, Susmita and Newton’s child, was excited. The loudspeakers were on; the pandals were colourful, decorated with lights; bits of dhak and kashor: Dhyaang tateng! Dhyaang tateng! went the sounds; people were walking about and happily chatting with each other. The children’s excitement was mixed with fear of possible rain. After visiting three or four spots, Mashima decided to leave for home with Lalon. We remaining four, Susmita, two of her younger friends and I, continued to walk around. At all puja spots the same scene would repeat itself, though I could smell the different fragrances coming out of the dhunduchi, incense burners, at different places. Soon I tired of the dhak and kashor and wanted to get away. So when somebody said how about a rickshaw ride on the highway, I was happy. The road was very straight and in deep darkness. After five minutes there were no more electric lights. I assumed from roadside shapes that there were a great variety of trees around us, those that survived the developmental planning. It was a night in late autumn, Kartik month, with dewdrops. Hallucinatory. We went on for a long time, then sat down for some tea in a kerosene-lamped tea stall, the two rickshaw-pullers and we four. The shopkeeper was angry at some official of the Palli Bidyut (village electricity) board. He was paying for an electric line to the shop, and all he got were power failures. Then we got on board the rickshaws again, and the dewdrops made me think of the fertilized lands around us waiting for water, for the dewdrops, for moisture, for Hemanta, for the winter. I heard distantly, in an imagined forest : Dhyaang tateng! Dhyaang tateng! Dhyaang tateng! I was lost in the past, running, my loosely elasticized pant slipping from my waist. Running, running. Towards the direction of the sounds, towards Barguna, the place where I was born. Where the legs of the drummers were dancing with a delicate rhythm. Running on legs that were not used to such effort. Running towards the small town of Barguna, from a rickshaw on a tiny highway in Kishoreganj, after so many years.